Using 3.25mm needles – 24 st to10 cm. I didn’t check the number of rows since this didn’t matter as I was measuring length as I went along. Using 2.75mm needles cast on 97 st.
Row 67: Change to 3.25mm needles and continue in stocking stitch starting with a knit row. Then shape shoulders, cast off 8 st at the beginning of the next 4 rows. Leave remaining stitches on a holder to be used when completing the neck. Complete front as for back up to the point where you want the V-neck to start – this was row 90 for me. 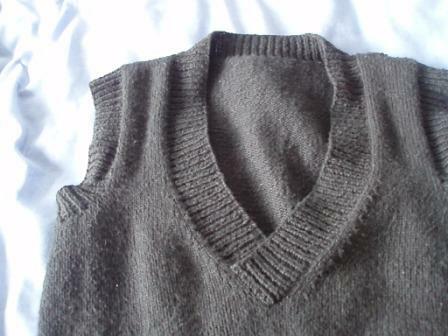 Continue straight until armhole measures 18cm (196 rows). Sew the shoulder seams and the side seams together before completing the banding for the armholes and neck. Pick up 103 stitches evenly over the armhole (to do this instead of picking up every stitch, I picked up 2 stitches then missed 1). Using a 2.75mm circular needle complete 14 rows in K1 P1 rib. 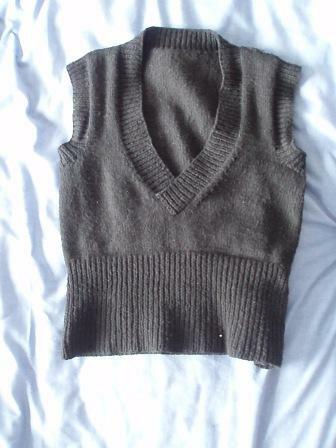 I didn’t knit this in the round, instead I sewed the seam up hence using an odd number of stitches. Pick up 189 stitches evenly over the neck (again I picked up 2 stitches, then missed 1). Using a 2.75mm circular needle complete 14 rows in K1 P1 rib. Again I didn’t knit this in the round, instead I sewed up the seam by overlapping.